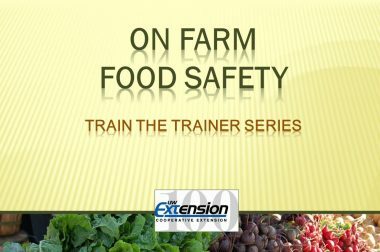 The On Farm Food Safety Train the Trainer Series has been developed to educate Cooperative Extension agents and other service providers working with fruit and vegetable growers. The goal of this training is to familiarize individuals with food safety, and the USDA standard for Good Agricultural Practices (GAP) and Good Handling Practices (GHP) increasing their capacity to assist growers in these areas. If you have questions or comments about this program please contact Kristin Krokowski, Commercial Horticulture Educator at kristin.krokowski@ces.uwex.edu. This program was developed in collaboration with the Wisconsin Department of Agriculture Trade and Consumer Protection. Thank you to the United States Department of Agriculture for funding this program. Part 1: Food Safety Essentials: An Overview of Good Agricultural Practices and How to Apply Them on Small Farms. Do you know what the USDA’s Good Agricultural Practices (GAP) and Good Handling Practices (GHP) are and how produce growers can apply them? These standards encompass a broad array of ways growers can improve their on farm food safety. Join us to learn about now to apply these food safety principles in the areas of manure, irrigation, pest control and hygiene. PRESENTER: Dr. Erin Silva is an Organic Production Scientist with the University of Wisconsin Department of Agronomy and Center for Integrated Agricultural Systems. She has conducted organic research both in New Mexico and Wisconsin, including projects involving no-till vegetable production and cover crop systems. Erin currently serves as co-facilitator of the Wisconsin Organic Advisory Council. As a graduate student, Erin cultivated an organic market garden and sold the produce at the local farmer’s market. 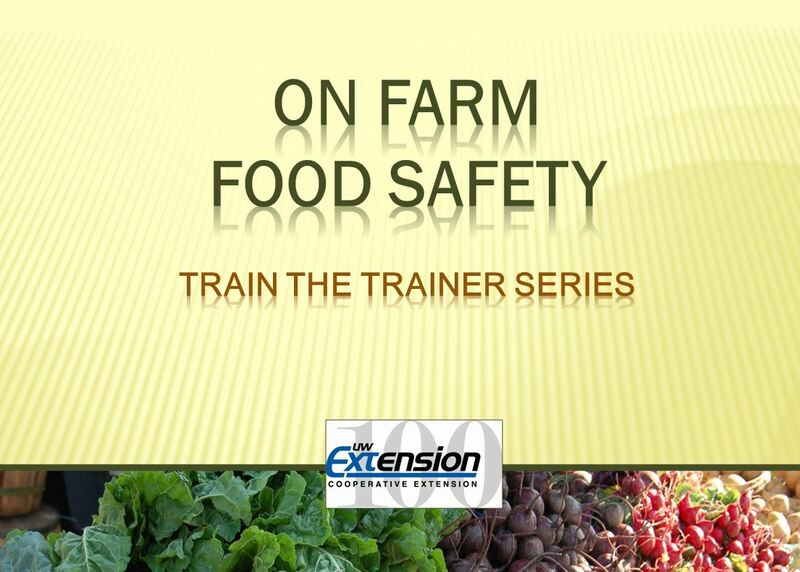 VIEW: Food Safety Essentials: An Overview of Good Agricultural Practices and How to Apply Them on Small Farms. Part 2: Good Handling Practice Guidelines for Fresh Market Vegetables. Do you know how to help produce growers prevent food born illness? To help these growers identify and manage potential pathogens, the USDA’s has issued standards for Good Handling Practices (GHP). This presentation will introduce GHP guidelines for fresh market vegetables and how to use them to minimize food borne food safety risks. Topics will include designing and building a washing and packing facility to minimize food safety risks, GHP guidelines on water, hand washing, pest control, cleaning and sanitizing, and record keeping. It will also include a list of resources available to growers. PRESENTER: John Hendrickson is an Outreach Specialist for the Center for Integrated Agricultural Systems at the University of Wisconsin in Madison. His work focuses on fresh market vegetable production and direct marketing. He also coordinates the Wisconsin School for Beginning Market Growers and is a vegetable farmer himself. Part 3: Third Party Food Safety Audits: Details and Dilemmas. If a grower called and asked if they needed a food safety audit would you have an answer? There are different types of food safety audits and not all growers or buyers know what kind of audit they need. This presentation will help sort out the different types of audits, who really needs one and the right questions to ask both growers and buyers to save everyone time and money. PRESENTER: Elizabeth (Betsy) Bihn is a Senior Extension Associate in the Department of Food Science at Cornell University. She is currently the program coordinator for the National Good Agricultural Practices (GAPs) Program. The goal of the National GAPs Program is to reduce microbial risks to fresh fruits and vegetables by developing a comprehensive education and extension program for growers, farm workers, produce industry personnel, students, teachers, and consumers. Betsy received her B.S. from Ohio State University in zoology and her M.S. from the University of Florida in horticulture. Part 4: Building a Food Safety Plan/GAP/GHP and Resources Available through the Wisconsin Department of Agriculture Trade and Consumer Protection. What is a food safety plan and where should a grower start in putting one together? Food safety is important and a good food safety plan can help growers save both time and money during an audit. This presentation will explain what a food safety plan is and how to help growers find the resources for putting together a food safety plan that fits their needs. This presentation will include an overview by Teresa Engel of the food safety resources available in Wisconsin through the Wisconsin Department of Agriculture Trade and Consumer protection. PART 4: Building a Food Safety Plan/GAP/GHP Resources Available through the Wisconsin Department of Agriculture Trade and Consumer Protection.